As strong German forces moved to secure their southern flank and rectify a failed Italian attempt to invade Greece, Allied forces found themselves in a steady retreat towards Crete. Extensive air operations saw large numbers of RAF aircraft engaged in fighting with both German and Italian air force units and despite initial successes, the came under increasing pressure. Perhaps the most successful Hawker Hurricane Mk.I fighter of this difficult period was V7795, usually flown by Pilot Officer William Vale, of No.80 Squadron, Royal Air Force. Still displaying its standard RAF day fighter camouflage scheme, this unusual aircraft also included some additional field applied camouflage modifications to the leading edge and engine cowling, which were applied to just a small number of Hurricanes. Vale claimed eight enemy aircraft destroyed whilst flying this aircraft, during April and May 1941. Following the success of the Hawker Hurricane during the Battle of Britain, it soon became clear that the Spitfire had the greatest potential for future development, which released the Hurricane for other duties. 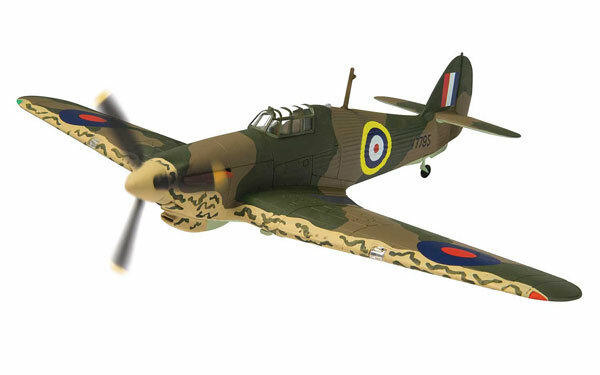 The rugged design of the Hurricane and numbers available to the RAF saw many machines sent overseas and as the war began to spread across the globe, so did the influence of the dependable Hurricane. From North Africa to Russia, the Hurricane continued to provide sterling service and continued to destroy Axis aircraft and military vehicles.